I am a food & movement teacher working from the premise that telling people what to eat and how to exercise doesn’t work. I offer students a crack at a healthier relationship with food and their bodies by giving them the tools, guidance and support they need to make to make choices that really work for them and to navigate the storms of life when they happen. I am enthusiastic, kind and work creatively and flexibly with the unique challenges that every one of us brings to the table. I spent years dieting, trying to be good and desperately trying to eat “healthier”. The more I tried to restrict, the more I ate – miserable, obsessed with food and longing for a different body. In the 25 years since I stopped that madness, I have learned that the best way to feel good about the way I eat and the way I feel in my body is to cultivate choice, abundance and vitality. I’m on a mission to teach others how to feast and to dance their way to a saner approach to weight loss and exercise…and fill up on the juiciness of life! Every one of us has a unique combination of strengths, preferences, challenges and dreams to work with. Rather than farm out a one-size-fits-all “plan”, I prefer to work with the universal principles and teachings of mindfulness and humanistic self enquiry backed up by a very practical and hands on style. I teach a variety of skills and practices ranging from healthy eating to cooking to menu planning to conscious dance and embodied movement. Rather than giving you lists of things to do and rules to follow I’ll show you what questions to ask and what to do with the answers. So that you become your own Guru. We meet on Skype, FaceTime, telephone or in person and work with whatever you feel is forefront for you. Stuff I’m good at: healthy eating, sustainable fitness, restricted diets, meal planning, eating disorder recovery, emotional & stress eating, “couch potato” syndrome. Number and frequency of sessions depends on many factors. I start with a minimum commitment of 6 sessions over a period of 3 months as regular, ongoing support makes all the difference. 4 week online group coaching webinars on specific aspects of our relationship with food and our bodies. The small group coaching includes 4 x 1hr coaching sessions, once a week spread over 4 weeks. 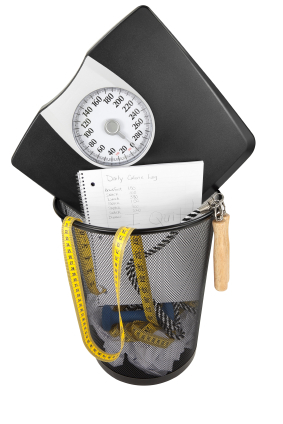 Topics include: Healthy Eating Redefined, Beyond Exercise, New Year, Same Old You and other one off themes. There is a group coaching webinar starting pretty much every month – updates on Facebook. This small, ongoing coaching group is for anyone who likes the idea of working with other committed people on the same journey, with regular check-ins and access to mentoring at a quarter of the price. The bonus is the learning you get from hearing other people’s experiences and ah-ha moments. We meet by phone or online 4 times a term for an hour. Minimum commitment 2 terms. I have a waiting list and new coaching groups starting regularly. Please get in touch using the form below if you’d like more information on joining. 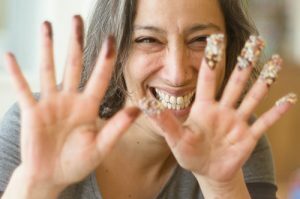 I regularly run workshops and retreats with my sister Sophie in London and Italy based on the Beyond Chocolate approach. 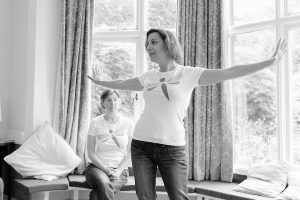 On our retreats I hold cooking and eating sessions in the kitchen and conscious dance sessions daily. I have been in the business of supporting women to transform their relationship with food and their body for over 17 years. I have delivered hundreds of workshop hours and movement sessions and guided many clients to a new way forward with weight loss and body image. My mother is French and a great cook. It’s from her I learned the basics of feeding a family, menu planning and shopping. I cooked a lot growing up, every night for my Dad in the years she was working evenings. I still cook a lot: from feeding my family to friends to planning and executing the menus on our retreats, to being kitchen co-ordinator at events feeding up to 70 women 3 meals a day. I host “Cook & Eat” workshops, Beyond Chocolate Feasts and regularly bake for events in my dance community. Over the years I have served hundreds of tasty, nourishing, freshly prepared meals adapted to a variety of tastes, preferences and dietary requirements. I love food and I want to pass that love of food on to others. Falling in love with food again after years of yo-yoing between deprivation and overeating is a wonderful thing. ‘Moving not exercise’ is my mantra and ‘Own Your Body’ is one of the Beyond Chocolate Principles. 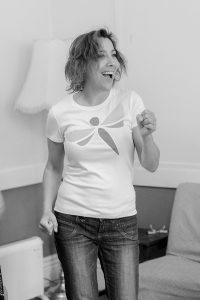 As a movement coach my aim is to support everyBODY to move in an enjoyable, sustainable way for life. I discovered conscious dance and mindful movement over a decade ago and have never looked back. As an Open Floor dancer and teacher in training, what I am constantly amazed by is how beautifully embodied movement fits in with the approach we teach at Beyond Chocolate. Perhaps my best qualification for the work I do is that I have first hand experience of what it’s like to struggle with disordered eating, serial yo-yo dieting and sustaining a healthy lifestyle. They say that we teach what we need to learn the most. It’s true, passing on what I’ve learned over the years keeps me walking the talk. I have a genuine understanding of the challenges and can teach from a place of authenticity and service. Menu Planning and Intuitive Eating: How Does It Work? Not sure or all of the above! Ask a question or tell me a little more...How can I help? 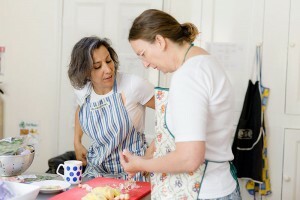 I have taken part in food and movement group coaching sessions with Audrey and both were life changing! 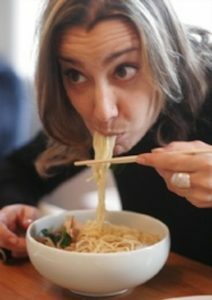 Audrey brings a passion to food and movement that is infectious. She works tirelessly to find food that I enjoyed and that fitted in with my lifestyle and my particular preferences. As a result, most of the food in our house is now cooked from fresh ingredients; we plan every week so that we have enjoyable, tasty food every day; I’m no longer scrambling about towards the end of the week for something to fill us and ending up with “freezer surprise”! During the Beyond Exercise sessions, she gently encouraged me to incorporate movement into my life in a way that was enjoyable and easy for me. There was no strict plan to follow, but a series of intentions that quickly became a habit. Most of all, Audrey gifted me with the ability to be flexible so that when life changes, my routines can change and still keep me in a position where I feel good about myself. She cares about food & movement and that care and passion really shines through – and is infectious! I’m moving in ways I enjoy 3-4 times a week, but not beating myself up when I don’t. I feel better in myself and food and movement are less of an issue nowadays. I would recommend the coaching to anybody stuck in a rut with the same old recipes, or anybody who thinks they’re too busy to eat well. Ironically it actually works best when you’re manic. When I don’t plan, I don’t end up eating what I want but make do with the same old things. This is when binges occur. Working with Audrey organises you in a way that is flexible and helpful. Coaching with Audrey was so amazing. Audrey helped me focus on foods I like and would nourish my body and mind. She was understanding and non judgmental and I was able with her guidance to look at planning my eating and meals to fit round my work schedule and lifestyle. I am at the beginning of my ‘non dieting’ journey but Audrey has given me the confidence and belief that I can enjoy food. Thank you Audrey I now have much more clarity on how to approach my eating. I feel so empowered and ready to take on the challenges and enjoyment the Beyond Chocolate approach has given me. Working with Audrey has been brilliantly helpful. After a couple of sessions with Audrey I walked away with the methods to have all dinners planned out and new recipes that would appeal to the taste of everyone in the family. Audrey’s wonderful skills have dramatically changed the amount of time, money and effort that goes into family meal times and over all we are much more organised, healthier and happier.